Spring is the perfect time of year to start talking to your children about the importance of gardening. What better way to talk about gardening than by reading a few books together? These beautifully illustrated children’s books about gardening are the perfect way to start learning more about the subject while also enjoying the splendor of nature through a good story. Why read to kids about gardening? Teaches them about where their food comes from. My first job as an RD was teaching nutrition in pre-K and elementary school, and I was always surprised at the number of students that were unaware of the basic concepts of gardening, growing food, and the food chain. It’s something that we seem to have gotten away from and I think it’s a great time to bring it back! Gets them excited about a way to be active. Gardening is a great way to stay active together, and all the raking, digging, patting, etc can be a good mini-workout for you and the kids. Engages them in a fun family activity. I don’t know about you guys, but I’m always looking for more ways to engage my kids in activities besides screen time! Prepares them with basic concepts to grow food. And what’s more exciting than being able to taste the fruits of your labor?! Share in the Gaines’ family’s love of gardening with this beautiful book illustrated by Julianna Swaney. We Are the Gardeners is the personal story of the Fixer Upper family’s adventures in starting their own family garden and is accented with lovely watercolor illustrations. Throughout the book, you and your children can read about all the obstacles overcome and lessons learned as this beloved family worked to grow their garden from a single fern to a bustling vegetable garden. This New York Times bestseller tells the story of one boy’s quest for a greener world. The Curious Garden features beautifully told story that touches on larger issues, like environmentalism in an urban world, while remaining easily accessible to a child reader. The heartwarming story is accented with outstanding illustrations that make the gardens pop among the urban landscape. Older children will love the story and younger readers will have a blast with the look-and-find elements of each illustration. Based on the true story of pioneer and activist Kate Sessions, The Tree Lady tells the story of a tree-loving woman who helps San Diego transform from a desert town to a city known for its lush gardens and parks. Sessions was the first woman to graduate from the University of California with a degree in science and set out to bring greenery to a desert city. This interesting biography offers an inspirational story for children seeking to make a difference. And it’s only enhanced by the beautiful imagery throughout this lovely picture book. While most gardening books focus on the plants, this pretty picture book takes its readers under the ground to view the innerworkings of a garden. From earthworms digging through the dirt to skunks burrowing underground, Up in the Garden and Down in the Dirt will take your young reader on a beautiful journey through the wonders under the flowers’ stems. Fans of Lois Ehlert will love the vibrant artwork featured in each one of her books. Planting a Rainbow takes these beautiful collage illustrations to the garden, offering young readers a pretty introduction to gardening. This short picture book outlines the lifecycle of a plant in an easy to understand way – with tons of colorful pictures. Another one of the classic children’s books about gardens, Growing Vegetable Soup showcases the tools and steps taken to grow vegetables for Dad’s vegetable soup. Seeds are planted for vegetables like green beans, peas, corn, zucchini, and carrots. In the end, the little one learns that making your own vegetable soup is the most delicious soup there could be. This book has bold colorful illustrations and is great for the little readers in your family. Teach your children the best ingredients for a compost pile with this beautifully illustrated picture book. Compost Stew: An A to Z Recipe for the Earth offers a child-friendly introduction to composting, from an explanation on where to start composting to a detailed list of items that are safe to include in a compost pile. Using positive psychology, this adorable children’s book equates gardening to cultivating happiness in your own life. Through the entertaining text and pretty illustrations in Grow Happy, your children will learn how to build a garden and how to use their gardening skills to make themselves happy. This informative book also includes a note to parents about how to use the book and the information provided within it. In The Vegetables We Eat, your children will learn all about the multitude of vegetables that they can eat. With beautifully detailed illustrations, this informative book explains each vegetable variety, how they are grown, and how they benefit your children’s bodies. In addition to interesting illustrations, this educational book also includes a variety of diagrams and cross-sections that provide a wealth of information on all kinds of vegetables that can be grown in your family’s garden. From pea pods to strawberries, From the Garden: A Counting Book About Growing Food shows your little one just how many ways you can count in a garden. Your young reader will love showing off their counting skills throughout this beautifully illustrated gardening book. Whether they count the fruits and vegetables on each page or seek out the hidden numbers throughout the book, your youngster will have a blast with this beautiful garden book. Worms are an essential part to any garden, so this silly book is a perfect addition to this list. Your kids will enjoy taking a peek below the dirt in Yucky Worms to learn all about worms, including where they live, how they move, and why gardens need them in their soil. The humorous text throughout this fun book is matched by the interesting pictures on each page. 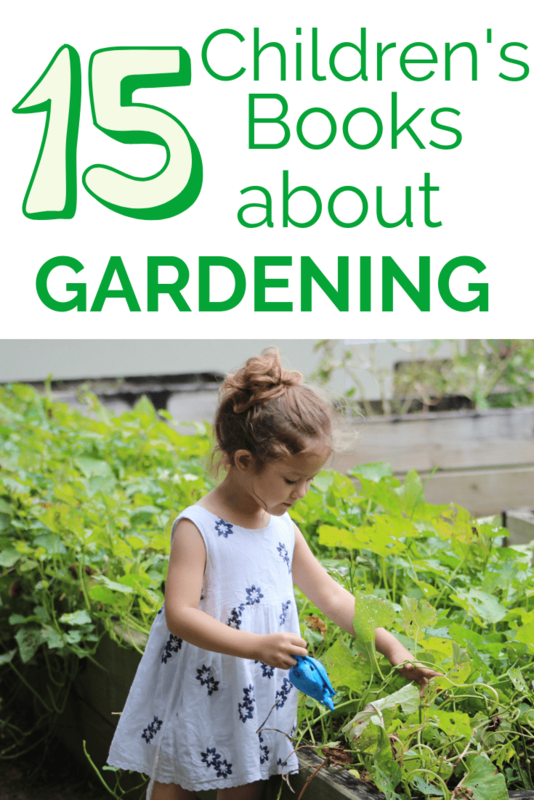 It’s never too early to start teaching your kids about gardening when you have this book! What’s in My Garden is a book that showcases the different colorful vegetables in the garden. With pull out flaps, vivid illustrations, and lots of color – this is a great book for the 1-2 year old children at home. Plus, the dual Spanish/English language adds another element of learning. Secrets of the Garden chronicles what a little girl, Alice, observes in her family’s backyard garden. Hiding in the bushes and peeking in, she learns about how the plants grow, sprouts, the food chain, composting, and more. A great book for kids about gardening! This gardening book is another ideal choice for the littlest readers in your house – think babies and toddlers. The Little Gardener is a small board book that showcases the tools and supplies you need to create your own garden, from shovels to pails to seeds to water. The lift-the-flap style is always engaging for young readers! The Messy Bessey line of books is an excellent collection to start reading to toddlers, and then they can transition to reading on their own as able (the reading level is right for a kindergartner or first grader). Unlike some other lines of children’s books, each of these books has a purpose and positive message in it. That includes Messy Bessey’s Garden, where she learns about the basics of gardening and planting seeds. Bonus: it’s nice to see some diversity in children’s books; I love that the title character is African American. Looking for more children’s book ideas? Don’t forget to check out our roundup on Christmas books for toddlers – great inspiration for holiday books for your family! Share: Are there any other children’s books about gardening that you love reading to your kiddos? Which of the books on this list are you hoping to add to your collection?